Guests ask us this question all the time! 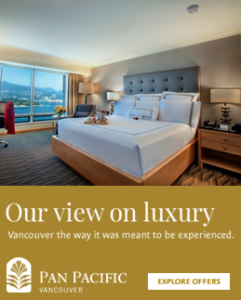 We thought we’d hit up our Associates and get their personal recommendations on all that the Pan Pacific has to offer and how to make the most of your stay in Vancouver. Consider this your insider tip! This edition is brought to you by Sales Coordinator Jordan Houston. As our former Assistant Restaurant Manager, he is definitely the insider source for the best that Oceans 999 and Coal Harbour Bar have to offer. Q: What is your favourite dish at Oceans 999? 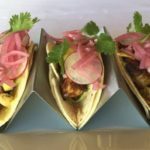 A: Tacos and seafood are two of my favourite things, so I can’t get enough of our Line Caught Ling Cod Tacos with jalapeno avocado crema, pineapple salsa, and queso fresco. I can never resist these tacos with a West Coast twist! Q: What is your favourite drink at Coal Harbour Bar? A: Ask Patrick to make you a margarita – hands down the best in the city. You won’t be disappointed (and it’s the perfect drink to go with those tacos). Q: What would you recommend visitors see or do in Vancouver? A: We are incredibly lucky to have so many outdoor activities at our doorstep in Vancouver, and hiking or snowboarding one of our local mountains is definitely a must. I highly recommend hiking to Garibaldi Lake: a 9 kilometre hike each way through a majestic forest of red cedar and Douglas fir trees. 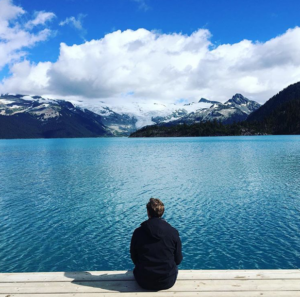 Once you reach the lake, you are surrounded by beautiful snow-capped mountains. Sediment from the glacier suspended in the water absorbs and scatters the sunlight, leaving the lake a gorgeous turquoise colour. You can access this hike off the Sea to Sky Highway between Squamish and Whistler, making it a great option for adventurous Vancouver visitors! Thank you so much to Jordan for sharing his tips with us! Any questions? Let us know in the comments below. Connect with us on Facebook, Twitter and Instagram to stay in the loop with everything going on at the Hotel and around Vancouver, and follow our Instagram Stories for a behind the scenes look at #panpacificvancouver life!